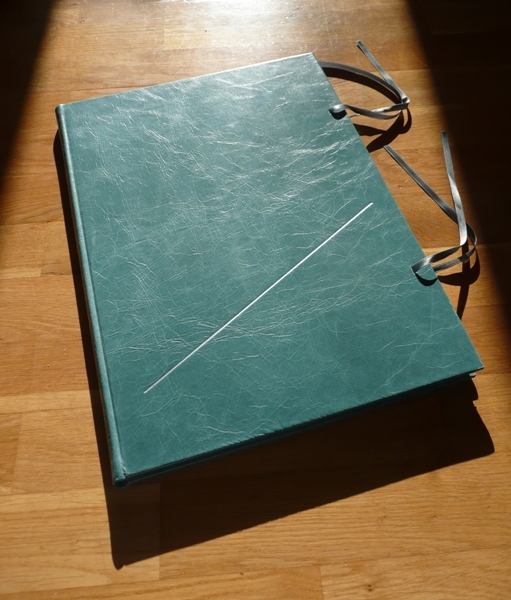 The book is printed and the first sixty copies are just back from the binder. If you have reserved a copy and have not yet paid you should have received an invoice from us! In the event I found I had enough 14pt Caslon Old Face to set four pages at a time before having to dis for the next ones. Strangely, years ago when I bought the type from Stephenson Blake shortly before they closed down, I kept back two founts of lower case and they were still in their sealed packets - I have no idea what prompted me to look where I did though I knew I had some Perpetua still unopened. There they were and I was able to fill another case. I had also forgotten just how sharp fresh type is and how raw your finger ends can get if you are not used to setting any quantity. The printing went without drama and satisfyingly. I printed all the 14pt first and then the shorter passages under the images in 18pt, finishing off with the title page (time to use the delicious 48pt italic) and the colophon. 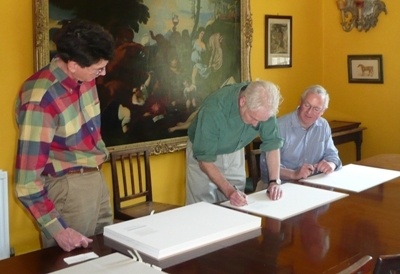 I took up to Ludlow Bookbinders all the sheets for the first sixty copies except the colophon sheets - which of course had to be signed by Hugh Buchanan and Peter Davidson - though I left two unsigned sheets with the binders so that they could make up two display copies for me. Crating up the colophon sheets to go up to Scotland for signature seemed a bad idea so we decided to drive them up, taking an overnight break on the way. A long drive but we had chance to visit one or two places en route before reaching Hugh's house outside Edinburgh on the Wednesday. Peter Davidson came down from Aberdeen on the Thursday and signing could proceed. It wasn't long before we were done and in the garden with a bottle of wine. We set off back from Edinburgh later the same day, swinging by Ludlow the following day to drop off the colophon sheets and pick up the two display copies that we took to Olympia and Bovey Tracey shortly after. A miracle of timing. There are 100 copies for sale with a further 25 not for sale. We are offering a pre-publication price of £220 (€270, US$370) for those who would like to be sure of a copy and are happy to pay now in return for a generous discount. The price on publication will be £275 (€330, US$450). Subscribers to the Press will receive their usual 15% discount on either price. (Shipping is charged extra at cost as usual. Euro and dollar prices might change with exchange rate fluctuations.) If you would like a copy at the pre-publication price please contact us and we can quote you the price including shipping. I hope to send out a small brochure shortly. Art in Action is a festival of fine art and master craftsmanship, where 150-200 artists set up their studios in several marquees. Additionally, in the Craft Market around 100 designer-makers - including The Old School Press - sell their goods. Do come and see us. Point your satnav at OX33 1JZ. 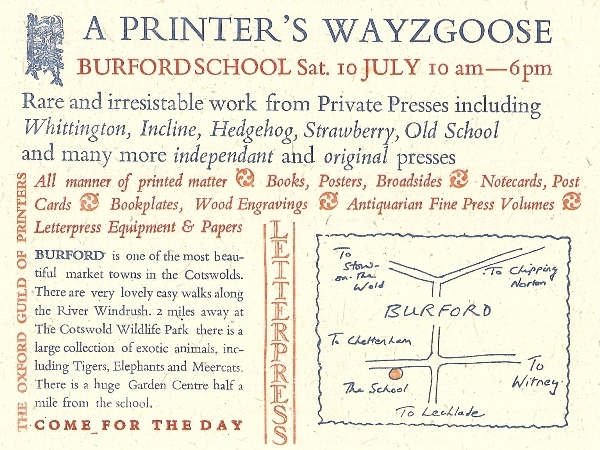 If you print, or are thinking of printing, or like printed things such as books and ephemera, then spend a great day at the Oxford Guild of Printers biennial Wayzgoose - point your satnav at OX18 4PL. 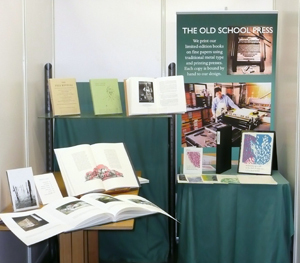 A handful of presses and binders decorated the cafe in the 'Downstairs' part of this Fair. Upstairs a second edition folio Shakespeare was on sale for £230,000, a tad more than our takings so we declined the offer. But at least everyone visiting was a book person even if modern firsts and incunabula were generally more to their taste than our output. But we made some new customers. It was also the first chance to show Winter Light and good sales encouraged us. The following week we sweated in the marquee at this annual Fair, always a well attended event also notable for a terrific (and terrifying) Punch and Judy show and excellent pies from Pie Minister. Rather unexpectedly, we also sold copies of Winter Light there too.